Clicker training can be a great way of positively teaching your pet new things, which is fun and enjoyable for both you and your pet. Many animals can be clicker trained, not just dogs and cats: rabbits, guinea pigs, ferrets, rats, hamsters, gerbils, birds, horses and a whole host of other animals have all been successfully clicker trained. Clicker training is a way of training your pet by positively rewarding it for good behaviour, the sound a clicker makes tells the pet that they have been good and that a treat is on the way. The quick and clear ‘click’ sound a clicker makes is far better than your voice, your voice changes dependant on your mood and because of this it’s very inconsistent. Also by the time you’ve praised your pet it might have moved its interest onto something else and therefore doesn’t always associate the treat with the action you are praising them for. By rewarding your pet after a clear ‘clicking’ signal for good behaviour turns training into a game, far more fun for both you and your pet. Your pet will look to repeat that same behaviour in the hopes of hearing that ‘click’ and getting a treat. So the first rule when clicker training is: whenever you click, you give a treat, even if you’ve clicked by accident. 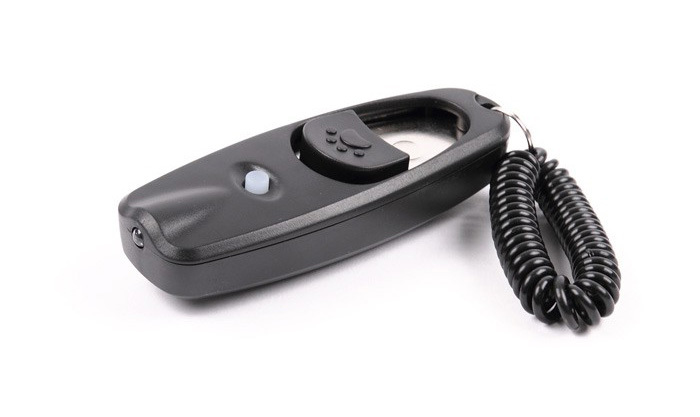 The first thing you will need is a clicker, at Pets Corner we sell a range of clickers to suit your needs, but before you start you will need to ensure that your pet isn’t noise sensitive. Some pets can become frightened when they hear a sharp noise. The next thing you’ll need is plenty of excellent quality treats and by speaking to a friendly Pet Corner member of staff, they will be able to advise you on the best treats for your pet. When clicker training you will use many treats, so make sure you manage your pet’s overall diet so they don’t become overweight. Before you start find a quiet area, somewhere you and your pet will not be disturbed and away from anything that might mean that either you or your pet might lose concentration. Remember to keep training sessions short, far more will be learnt in three five minute sessions than in an hour of boring repetition. Once you’ve found such a place, with your pet close by you, press once on the clicker and then immediately give them a treat – don’t be tempted to click more than once; to show you are really pleased with them, increase the amount of treats you give them, never the clicks. Repeat this several times and after a while, you will notice that when your pet hears the click they are looking to you for a treat – you are now ready to teach your pet some new skills. Start small at first, one of the easiest tricks to start training your pet is a simple touching game. Try and get your pet to touch an object, which could be a toy, a bowl, the end of a stick or even your hand. What you are going to do is award small steps, so the moment your pets approach the object, click and hand over a treat. Remember that the click is what you want them to notice, try not to talk at this stage, as your pet might find this confusing. Once your pet does finally touch the object, click immediately and reward them with extra treats, so they know they’ve done well. After your pet has done this a few times, you will notice that every time your pet sees the object, it will touch it. At this point you can start adding a word to indicate an action that you want your pet to perform, wait until your pet is just about to touch the object and then say the word “Touch”, once they’ve touched the object; click and then treat. Keep up this training over the next few days, slowly phasing out the clicks and treats until the only time you click and reward your pet is after the word “Touch”. Get your pet to show you the desired behaviour and click this behaviour while it’s happening and not afterwards. Reward your pet with a treat immediately. Don’t wait for perfect behaviour, click and treat for small steps in the right direction. But remember to keep raising the goal. Carry a clicker and try and catch cute behaviours when they happen. You can click for many different behaviours, whenever you happen to notice them, without confusing your pet. If you get mad, put the clicker away. Don’t mix scolding with clicker training; you will lose the animal’s confidence in the clicker and perhaps in you. If you are not making progress, you are probably clicking too late. Accurate timing is important. Above all, have fun. Clicker training is a wonderful way to enrich your relationship with your pet.